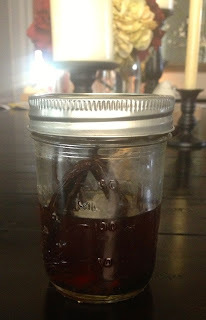 I love vanilla extract, but that stuff is expensive! In true diva hippy fashion, I got tired of paying too much and decided to make my own. When I decided to do it I had no idea that it was so simple and cheap. I don't know why everyone doesn't make their own instead of paying $8 a bottle of the stuff. The best part is that once you start making your own, you can just refill the bottle with the booze and tada! New vanilla extract. You never run out! Brilliant. And you have plenty of booze left overs to make a cranberry vodka or a screwdriver after you have one of "those" days. I don't know about you, but I consider that a win. Sometimes a girl just needs a drink! Oh, AND the other thing that makes me annoyed is the cost of a vanilla bean at the grocery store. $7 for ONE vanilla bean. ONE. Shame on you, Whole Foods! Shame! It makes me want to start a vanilla farm in my back yard. I could become rich! 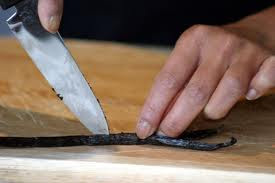 While pondering my life as a vanilla bean farmer, I found the solution to cheap, quality vanilla beans at Saffron.com. They sell it in bulk so you'll never run out! You can buy between 1/8 of a pound to 1 pound depending on your needs. You typically receive over 150 vanilla beans per pound so that gives you an idea of how many you will get. They have organic and regular and then different qualities so the prices vary, but they are reasonable. I ordered a pound of vanilla beans so it's less than a dollar per bean. A lot better than $7 for ONE. Seriously, I'm bitter about that. If I could go back, I would probably have bought less than I did because I still have A LOT of beans left over! I even made vanilla extract for Christmas presents and vanilla sugar for gifts, but I don't think anyone would ever guess that if they saw my stash. 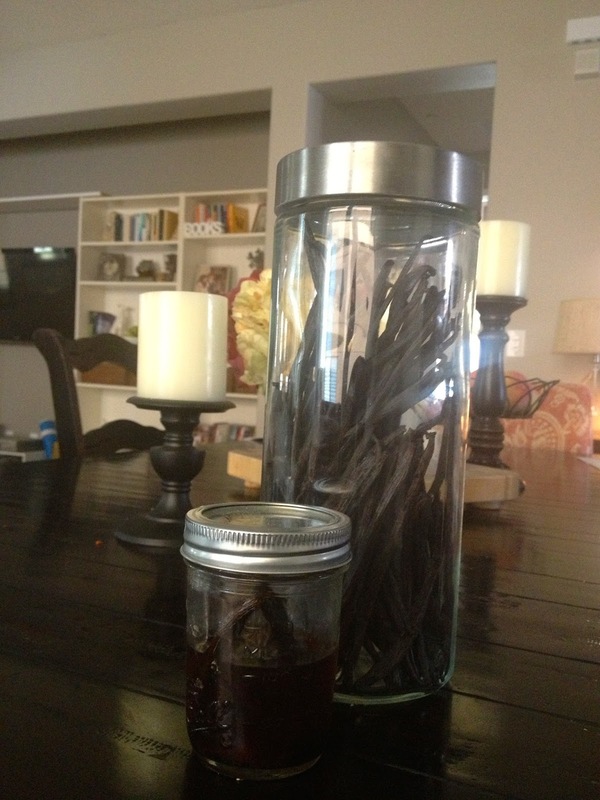 I actually might have enough vanilla beans to last me the rest of my life. You split the bean by lightly cut a line through the entire length of the bean. You should see little tiny dark brown bits coming out on to your knife. That's the gold! Place the beans into the mason jar and add the vodka. I cut my beans into sections because I used a small jar. Put it in a dark place and forget about it for 8 weeks. After 8 weeks it will have had the time to fully develop it's flavors and it will be ready to be used. Don't worry about the alcohol smell-- it will lessen with time and it will bake off if you cook with it. I made a whipped cream shortly after I made this and I didn't even notice it. 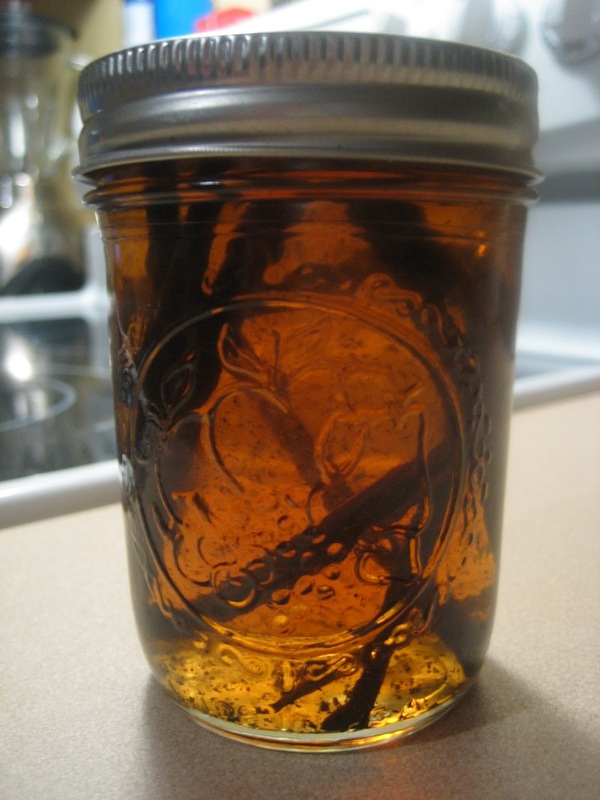 And remember, if you start to run low on vanilla extract, just add more vodka to the pre-existing vanilla extract. It will save you time and money! 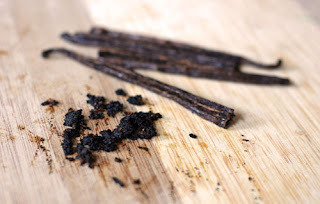 If you feel as if you want a stronger vanilla flavor, just add one more split bean. I made my first batch over two years ago and I still am using it. I've only had to refill it once and it works great in everything I've used it in. This picture to the left was my original batch after only 1 month of sitting. At the time I thought it was dark and I was so impressed with my bad self that I took this picture, but you want to wait for it to become a deep dark brown rather than an amber before you mess with it. This is mine as it looks today-- very dark and it smells so good. And behind it is all the vanilla beans I have left over. Want some? I hope you enjoy this recipe and the savings it brings to you!